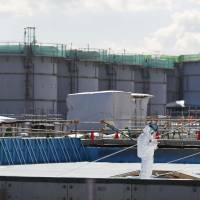 To dump or not to dump a little-discussed substance is the question as Tokyo Electric Power Co. and the government grapples with the aftermath of the nuclear catastrophe in Fukushima five years ago. The substance is tritium. 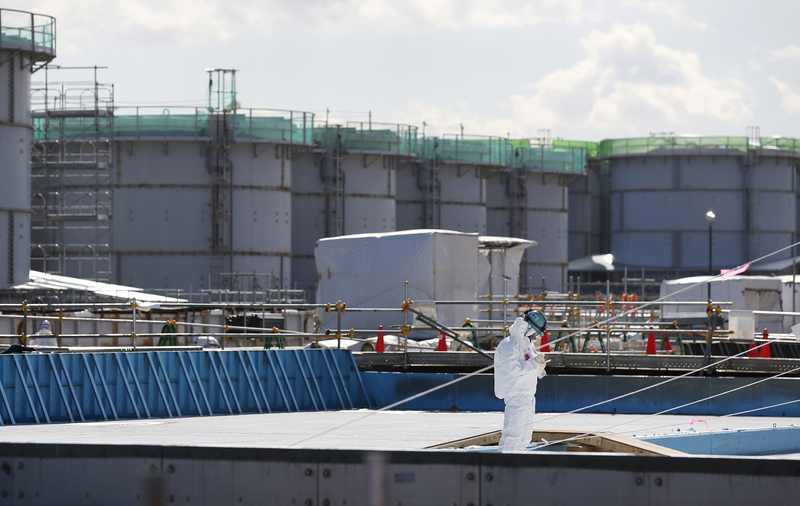 The radioactive material is nearly impossible to remove from the huge quantities of water used to cool the melted-down reactors at the Fukushima No. 1 plant, which was wrecked by the massive tsunami in the Tohoku region in March 2011. The water is still accumulating since 300 tons are needed every day to keep the reactors chilled. Some is leaking into the Pacific. Huge tanks lined up around the plant, at last count 1,000 of them, each hold hundreds of tons of water that have been cleansed of radioactive cesium and strontium, but not of tritium. Ridding water of tritium has been carried out in laboratories. But it’s an effort that would be extremely costly at the scale required at Fukushima No. 1. Many scientists argue it isn’t worth it and say the risks of dumping the tritium-laced water into the sea are minimal. Rosa Yang, a nuclear expert at the Electric Power Research Institute, based in Palo Alto, California, who advises Japan on decommissioning reactors, believes the public angst is uncalled for. She says a government official should simply get up in public and drink water from one of the tanks to convince people it’s safe. But the line between safe and unsafe radiation is murky, and children are more susceptible to radiation-linked illness. Tritium goes directly into soft tissues and organs of the human body, potentially increasing the risk of cancer and other sicknesses. “Any exposure to tritium radiation could pose some health risk. This risk increases with prolonged exposure, and health risks include increased occurrence of cancer,” said Robert Daguillard, a spokesman for the U.S. Environmental Protection Agency. Right after the March 2011 disaster, many in Japan panicked, some even moving overseas although they lived hundreds of kilometers from the Fukushima no-go zone. By now, concern has settled to the extent that some worry the lessons from the disaster are being forgotten. Tritium may be the least of Tepco’s worries. Much hazardous work remains to keep the plant stabilized, and new technology is needed for decommissioning the reactors and containing the massive radioactive contamination. The ranks of Japan’s anti-nuclear activists have been growing since the March 2011 accident, and many oppose releasing water with tritium into the sea. They argue that even if tritium’s radiation is weaker than strontium or cesium, it should be removed, and that good methods should be devised to do that. Fishermen have repeatedly expressed concerns over the issue. News of a release of the water could devastate local fisheries just as communities in northeastern Japan struggle to recover from the 2011 disasters. An isotope of hydrogen, or radioactive hydrogen, tritium exists in water form, and so like water can evaporate, although it is not known how much tritium escaped into the atmosphere from Fukushima No. 1 as gas from explosions. The amount of tritium in the contaminated water stored at Fukushima No. 1 is estimated at 3.4 peta becquerels, or 34 with a mind-boggling 14 zeros after it. But theoretically collected in one place, it would amount to just 57 milliliters, or about the amount of liquid in a couple of espresso cups — a minuscule quantity in the overall masses of water. Public distrust is running so high after the Fukushima crisis that Tepco has mostly kept quiet about the tritium, pending a political decision on releasing the water. Privately, Tepco officials say it will have to be released, but they can’t say that outright. What will be released will be well below the global standard allowed for tritium in the water, say Tanaka and others favoring its release, which is likely to come gradually later this year, not all at once. Proponents of releasing the tainted water argue that tritium already is in the natural environment, coming from the sun and from water containing tritium that is routinely released at nuclear plants around the world. “Tritium is so weak in its radioactivity it won’t penetrate plastic wrapping,” said Tanaka.